Sometimes I just have so much deadly important UFO stuff to write about that I forget to slow down and smell the roses... which have probably been charred at a UFO landing site. Today is one of those days: I've had major developments in the UFO sighting I'm investigating and in the J. Allen Hynek book project, and I need to blog about them both, but... but... I have been sidetracked by sweet smelling soaps. I took the time to read the Letter from the President in the November MUFON eJournal, and boy was I wrong about that guy. Sure, the Captain is a crusty old dog, but in his column he got all mushy about the coming holidays. Take Thanksgiving, for instance. He's thankful for every MUFON member, and thinks every last one of us is "top notch," from the members of the Board of Directors to the lowliest misfit. I'm in there somewhere, so that's good. But it's not just me he's thankful for: The Captain is thankful for our membership growth, for the increased stature of our organization, and for the "fresh, bright atmosphere sweeping through MUFON." He doesn't seem to have figured out yet just who is behind all those things, but I expect a call from him any day now. So the Thanksgiving thing is cool, but it turns out he's crazy about Christmas too! In fact, he wants everyone to have a wonderful Christmas. And the way everyone has a wonderful Christmas is for everyone to get wonderful MUFON merchandise from the MUFON eStore in their stockings Christmas morning! 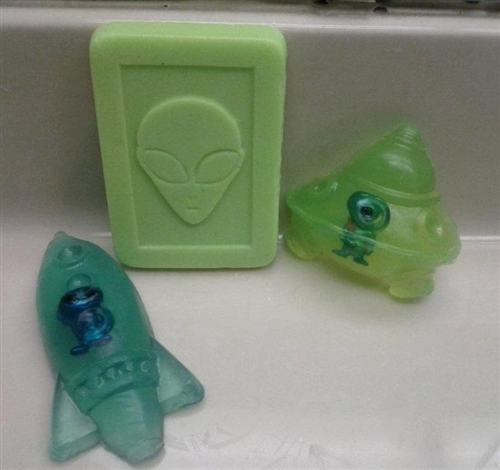 Things like alien soap. "They smell great!" The Captain advises us, and you know he's right. Manly yes, but aliens like it too! It's an "Out of This World" value for only $13.50 (you knew I was going to go there, right?)! But that's not all! 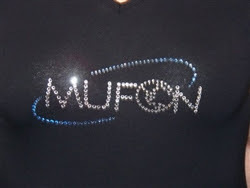 The Captain also enthuses about "Ladies shirts with the MUFON logo made of Swarovski crystal. 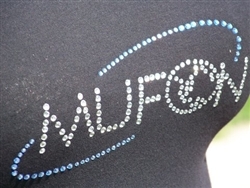 (These are "HOT")" When I first read this I was puzzled: how could I, a Certified MUFON Field Investigator, afford a ladies' shirt encrusted with fine crystal? And what lady would wear something so dangerous? I turned quickly to the Apparel section of the eCatalog and there it was... for only $35... the MUFON Sparkle Logo Ladies V-Neck Shirt! I am so glad I took a break from the serious side of UFOs. I needed this.